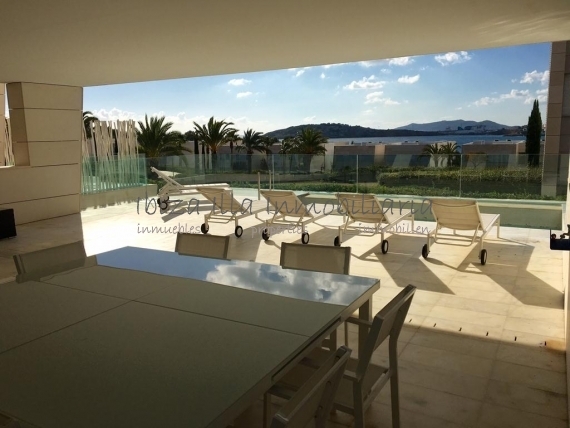 Fabulous apartment in one of the most coveted buildings of the bay of Talamanca (Ibiza), with straight lines and wide open spaces. Community guarded and very exclusive that guarantees your security as well as your privacy. From the pool area and communal gardens you can access the beach of Talamanca, having Ibiza town just a short walk away. The flat has a large surface that is distributed in a spacious hall with large wardrobes, living room with modern open plan kitchen, domestic office with bathroom (which can be the bedroom number 4), 3 suites 2 of them with dressing room and a guest toilet. The spacious front room has large sliding windows which lead onto the fantastic partially covered terrace with private pool. Garage space included in price.